In almost any way you look at it, Manny Machado’s 2017 campaign did not go well. He finished 12th out of 22 third base qualifiers in WAR and 19th out of that same group in Off rating. He ended the year with sizable decreases in just about every respect, ultimately finishing with a park-adjusted offense figure of just 102, painting him as a barely above average offensive player. That’s obviously not the Manny Machado that we’ve become accustomed to, and it’s certainly not the one that we should expect moving forward, as much of that production, or lack thereof, could be attributed to bad luck above all. Zone coverage wouldn’t appear to indicate a significant source of his apparent struggles, either. His hot spots throughout the strike zone were pretty similar, although there’s a slight increase in swings at the bottom of the zone from 2016 compared to 2017. Is that really enough to lead to such a decrease in linedrive rate, and a subsequent increase in groundball rate, from 2016 to 2017? There isn’t a whole lot to indicate that he should’ve struggled as much as he did. He made contact at a nearly identical rate to that of 2016 and actually made better contact in 2017 than in either of the two previous seasons. BABIP did him no favors, though, as Machado finished with one of the 17 worst averages on balls in play among all qualifying players, as well as among the third base group. It’s that category alone that could be the largest source of his woes from 2017. Of course, an additional source of the struggles could be the slow start and a rough finish. After average production in April, he struggled mightily in May and ended the year with a rough September, with wRC+ figures of 61 in the former and 52 in the latter. Those months did also feature a rise in strikeouts and a drop in walks from his total percentages on the season, which could indicate an element of pressing at the plate. What certainly didn’t help his case, though, was a .205 BABIP in May and a .238 mark in September, both of which came while not experiencing significant drops in his hard contact percentage from his season total. Could that bad luck have contributed to the potential pressing and resulting K & BB fluctuation? It’s possible, but also difficult to quantify. In the most general of senses, though, it really comes down to luck. The BABIP numbers were some of the worst across baseball, something far more indicative of his struggles than something potentially worse, such as if it were something mechanical. While nobody was ready to throw in the towel on the Baltimore third sacker, that type of drop in production is at least worth addressing. Ultimately, though, while there were a couple of low moments for Machado in 2017, as is the case with almost all non-Mike Trout players across Major League Baseball, there weren’t nearly enough to lead to the type of statistical woes that he experienced this past season. There were likely some intermittent issues throughout the year, some likely related to approach which could have affected his contact distributions, but nothing to indicate that this should carry over into 2018 and beyond. 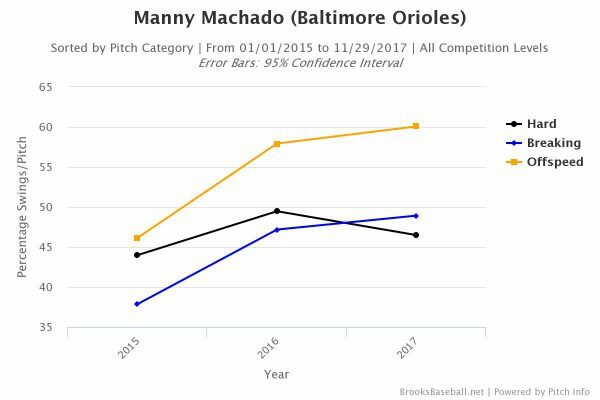 More than anything, the BABIP monster got to Machado in 2017. The offense should more than return next season. And even more so when he ends up in the Bronx in 2019. We hoped you liked reading Chalk Manny Machado’s Poor 2017 Up to Bad Luck by Randy Holt! I enjoyed the first 764 words of this 777-word article. 2019 is a number, not a word.